Critical Mass unites cyclists the world over, every last Friday of the month. The concept is simple; bring your bike and ride through the city streets, reclaiming the space, getting to know the city, meeting other cyclists and generally having fun. There are over 300 critical mass rides over the world each month so join in and get your wheels in motion. As they say, we have nothing to lose but our chains! 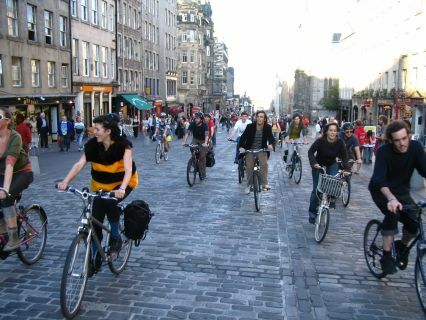 Edinburgh Critical Mass has been going for as long as anyone can remember and has seen some exciting times. There are thousands of cyclists in Edinburgh and many more who would like to cycle more, if only they felt a little safer, so let’s cycle together and send a message to other road users that we have a right to be there too. Critical mass is about strengthening the bike network and enjoying our two wheeled friends; so come along, it will brighten even the dullest of days! We now have an email list for co-ordination! Email: criticalmassedinburgh-subscribe@lists.riseup.net to subscribe. How did Critical Mass start? Critical Mass as a phenomenon originated in San Francisco in the early Nineties. Cyclists found the experience of riding around the city in numbers so empowering that they made it a regular event. As word of their rides spread, hundreds started taking part. Then thousands. A movement was born, Critical Mass — except it was one where there were no leaders and no political goals, other than to get people out of their cars and on to their bikes, legs, or public transport.